Smart has given the best idea yet of how its new range of cars will look, in the shape of the Smart Fourjoy concept car that will make its official debut at the Frankfurt motor show next week. 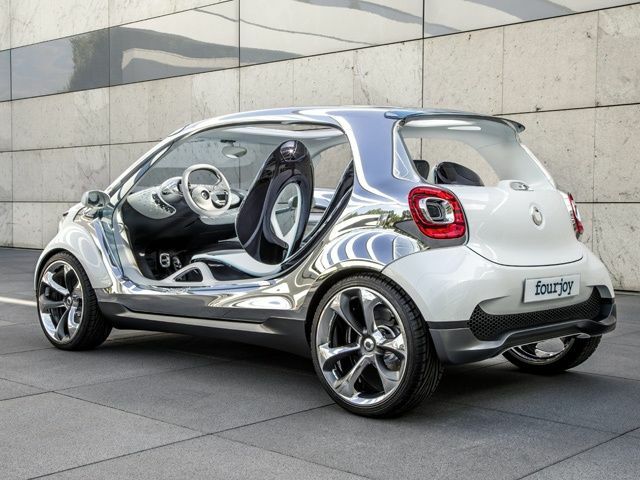 With doors and window added to the Fourjoy's body, and with some of the wilder concept car details toned down, this is how the new Smart Forfour will look when it goes on sale in 2014. Whereas the previous Forfour model was based on the Mitsubishi Colt, the next model is part of a joint development programme between Renault and Smart's parent company Mercedes-Benz that will also result in a new Smart Fortwo and Renault Twingo. All three models will share the same rear-wheel drive, rear-engined platform, although the Fortwo is expected to use a shorter version. Renault has hinted at the look of the next Twingo with the Twin'Z and Twin'Run concept cars, which were both revealed earlier this year. Smart has created a number of concept cars that hint at the look of the next Fortwo and Forfour models, but the Fourjoy appears to be the most representative yet. The Fourjoy incorporates many familiar Smart design cues, such as short overhangs and a "tridion" central cell with contrasting panels at either end. In this case the central section is in polished aluminium, while the rest of the car has a pearlescent white finish. Although the Fourjoy's one-piece front seats and unusual colours and materials won't make it to the production Forfour, the overall shape of the dashboard is likely to be retained. A version of the current Smart Fortwo Electric Drive's electric motor is used for the Fourjoy – it develops 74bhp and is powered by a lithium-ion battery.